The first question everyone asked me was "Why on earth are you going to Albania?" That's simple - as a child I used to love listening to Radio Tirana's propaganda broadcasts after they'd fallen out with the Eastern Bloc, proclaiming in a screechy voice that "The tractor production has risen by 150%!" 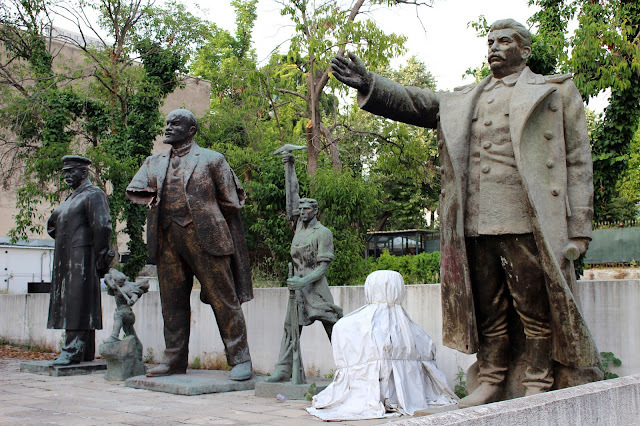 or denouncing "the capitalist lackeys of the Soviet Union" so it seemed like an interesting place to go. The second question was "Where is Albania?" That's easy too - it's over the Adriatic from Italy, and nestled between Greece, Macedonia, Kosovo and Montenegro. 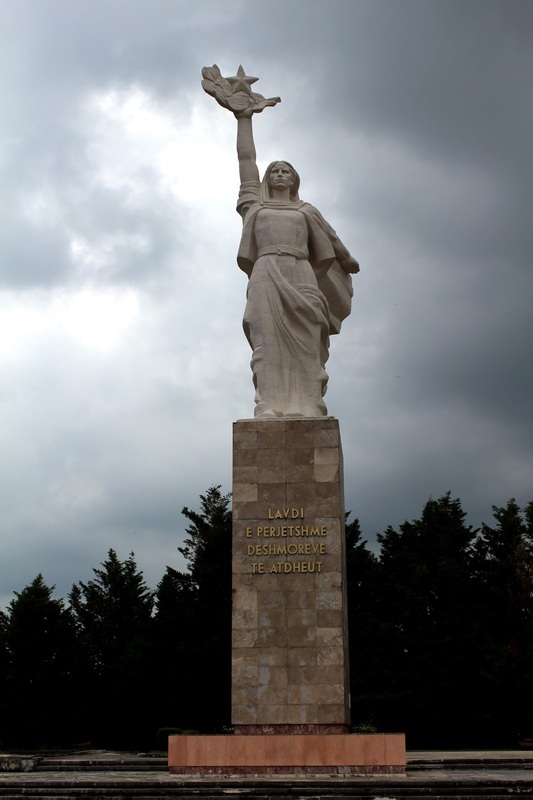 So here I was finally in Albania. Very smooth overnight ferry trip from Italy, then a crammed and stinky bus ride from Durres ferry terminal, a terrifying taxi ride through Tirana, and finally ensconced myself in an apartment on the 8th floor with a balcony view over the rooftops out to Mount Dajti, taking coffee to the sound of honking car horns and wailing sirens. The apartment was actually a two-bedroom one, and it was good to be able finally to unpack, spread out a bit and finally get my whiffy clothes washed. 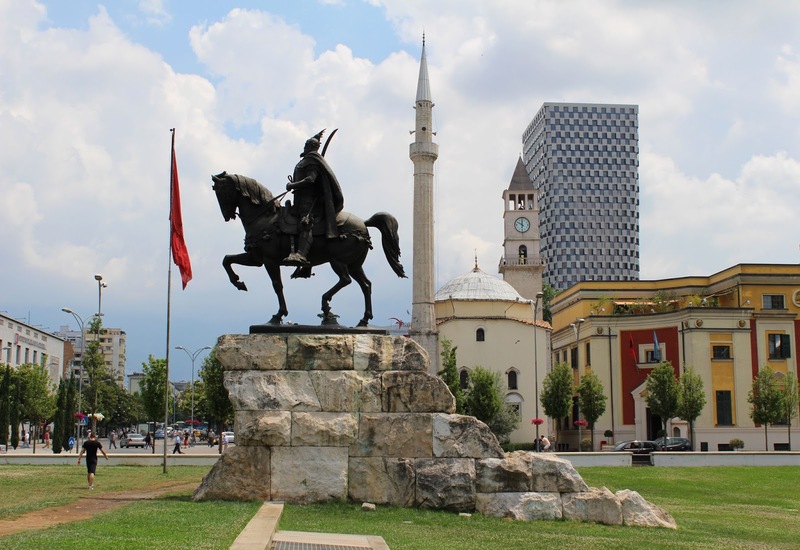 My first step was to get some Lek to buy food and beer so I strolled the few minutes down to Skanderbeg Square, a broad plaza flanked by the National Museum and Opera House, a mosque in one corner and a statue of national hero Skanderbeg atop his horse in the centre. It’s a challenge to see if you can spot the difference between the Mussolini era architecture and the Communist period: both favoured wide straight boulevards and brutalist monumental architecture so characteristic of the Eastern Bloc. What the earthquakes didn't manage to destroy of Albania's Ottoman heritage, Mussolini and Hoxha did. I quickly learned to cross the road Albanian style (head down and hope for the best; traffic may or may not stop) and spotted a poster for a dance performance at the Albanian National Theatre so picked up a ticket for £2.50. 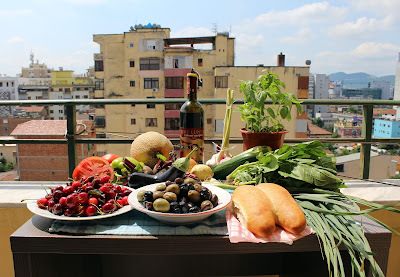 Back to the apartment and stocked up on huge tomatoes, bulbs of wet garlic, fresh basil and amazing cherries from the market just a few minutes down the road, a real feast for £6 including a bottle of Albanian wine and some local beers. I stopped for a beer at the market and got chatting with a guy in German, who’d worked in the GDR during the communist era. He was the first of many people to express curiosity about why I’d chosen to visit Albania on holiday, and on my own as well. The dance performance was quite an experience, in a building apparently constructed in 1940 to honour Mussolini. The spoken narrative of the performance was of course lost on me, something about a relationship between a woman and a man and their good and evil sides, with occasional descent into cliche, such as the man "playing" the woman like a cello, but the dance performance was powerfully physical, and the audience thought nothing of clapping throughout and taking flash photos. There was an amusing episode at the end when an unfortunate young woman tasked with handing flowers to the performers ran frantically on and offstage as the performers moved back and forth to take their curtain calls, attempting to fling their bouquets at them then hurriedly retreating, at one point having to duck quickly to avoid the swinging boom of a TV camera. Another trip to the market to stock up on more veg, and picked up lovely fresh bread from a hole-in-the-wall bakery near the apartment, where the young woman who spoke excellent English, translated while the other staff insisted I marry their son and take him to England. Had breakfast in a cafe nearby and I fell into conversation with a young man with excellent English, again baffled by why I was visiting Albania. He was an engineer at the waterworks, but sadly could see no future for himself in his country. This was a theme I was to hear repeatedly: lack of opportunities, a country barely out of decades of being closed off from the outside world and an economy just chugging along. Of course all the things that I loved about the country: fantastic scenery, warm friendly people, great food, fascinating history and so on, count for nothing if you want to make your way in life. The day’s plan was to do the rounds of Tirana, taking in Enver Hoxha's pyramid, the Martyr's Cemetery and other communist-era sites. 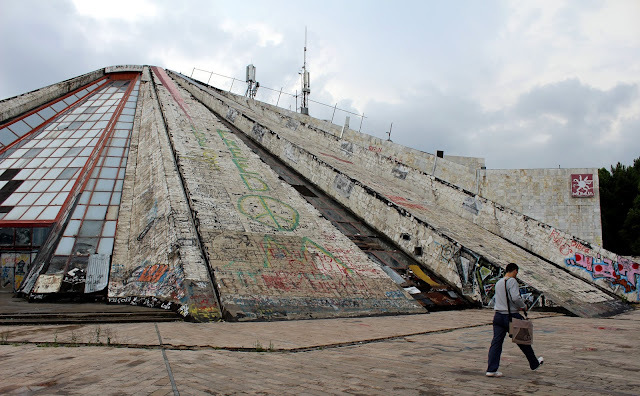 I started by strolling down the River Lana to the Youth Park, then past the heavily-fortified Russian Embassy to the pyramid. Enver's pyramid is an incredible display of arrogance, but what a thing it is! 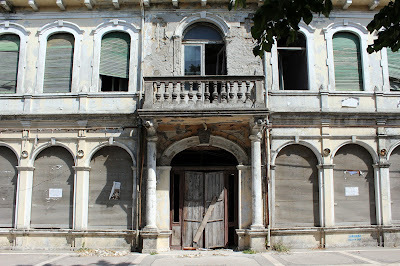 It’s totally dilapidated now, covered in graffiti and smashed up with broken paving stones and creeping weeds. Intended as Hoxha’s mausoleum, it was at one point a TV studio, and it'd make a great gig venue, though the city is apparently deciding what to do with it. 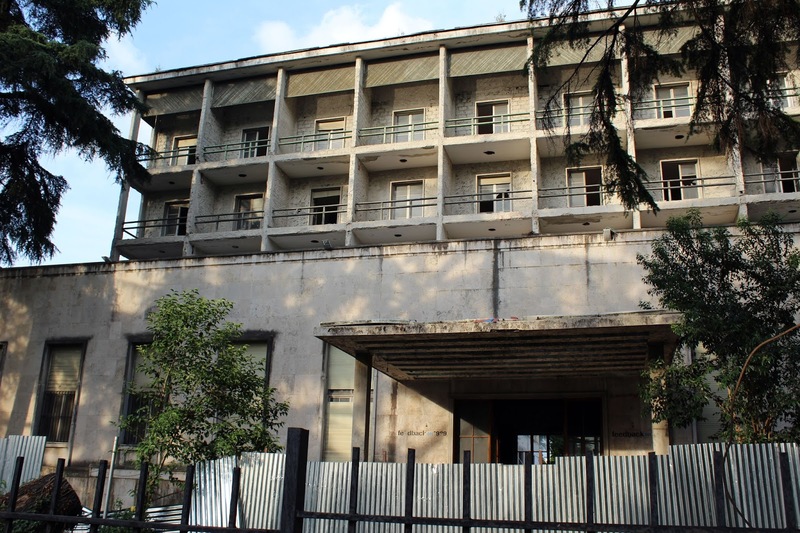 Hoxha’s house is nearby, an anonymous 1950s block, as well as a park commemorating that era with a section of the Berlin wall, Hoxha's bunker lid and part of a prison camp. 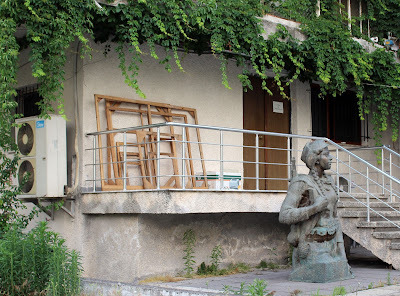 There feels like an ambivalent attitude toward buildings and artefacts of the Communist era, which of course as a tourist are fascinating, but for many constitute a painful reminder of a dark era. The Martyr's Cemetery is a couple of miles out of town via a wide boulevard leading to Mother Teresa Square, past the sports stadium and up a hill with a horrible dual carriageway, but once you get there it's amazing: up crumbling steps to find sweeping views over the city, surmounted by a huge statue of Mother Albania. 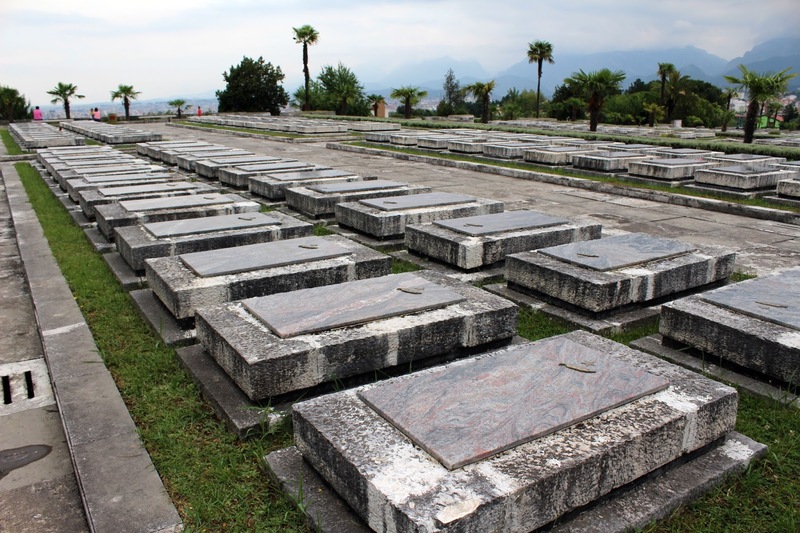 The cemetery commemorates the partizans who died fighting the Nazis when they invaded Albania, most of whom lost their lives in their twenties. 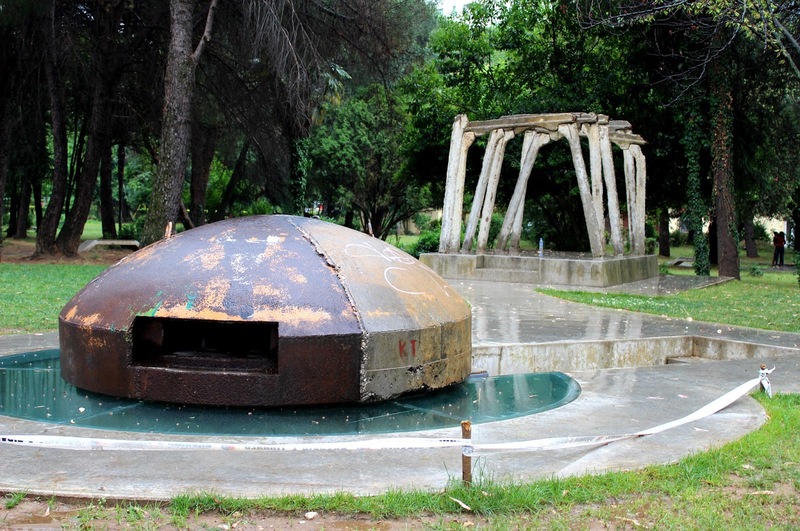 It’s a quiet peaceful place for contemplation away from the noise and bustle of Tirana, and a reminder of Albania’s complex and often bloody history. On the way back I found a brewery, Lilishte 1 Maji, which produces just one beer, brewed in the Czech pilsner style, and best of all it's £1 a pint. I returned home via Hotel Dajti, which was the main Communist hotel, forbidden to ordinary Albanians and only foreigners allowed to stay there, now falling into dilapidation. Peering through the fence, I spotted a statue of Stalin, and going round the block, found it along with others of Lenin and a partizan tucked around the back of the National Art Gallery, hidden from view. To see more photos, go to my Flickr photoset. Covering an awful lot of mileage in ol' Tirana town. From my balcony, apart from the higgledy-piggledy blocks, ramshackle roofs, satellite dishes and water barrels, I had a view directly over to the Dajti Mountain a few miles out of town. It's often cloud-shrouded, not at the top but below the summit, and is frequently hazy which is probably due to the pollution. 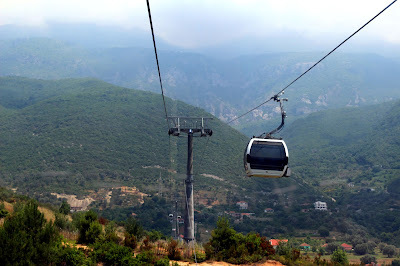 But there is a cable car running up it so today seemed like as good a day as any to go. I spent at least an hour trying to work out how to get to it on foot. The guide book said it was at the end of a particular street, which it clearly wasn't but all other info advised to get a bus or taxi. Sod that. The bus is only 15p but it's the principle, and walking is part of exploring a strange place. After two hours of getting lost, hiking in searing heat up mountain roads with pavements that were just rubble, having to head back down again, asking questions in pidgin Italian with lots of hand gestures and finally making a completely different turning, I realised the advice about getting a taxi was probably sound. But hey - I got there in the end and it was worth it. It's twenty minute almost noiseless glide over lush green mountainsides, farmland and water where you can hear the birds singing, ducks quacking and gunshots (not shooting people, but birds and ducks, and probably anything else that is furred or feathered). There are parts where it runs almost vertically and it's definitely not for anyone with a fear of heights. 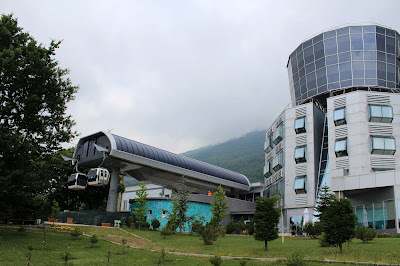 At the top there's a hotel with a revolving bar where I was the only customer and the waitress spent the entire time vigorously polishing anything with a vaguely hard surface (it was all extremely shiny) then I ventured out onto the mountain where the cloud had now descended. 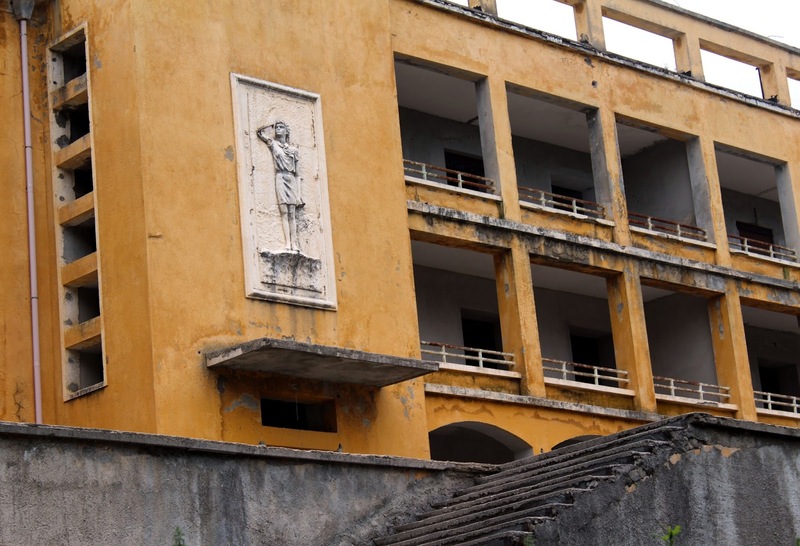 To my delight a bit further up I came upon yet another abandoned Communist hotel, with bas-reliefs of uniformed children, again falling to dereliction, but quite fascinating and definitely not mentioned in the guide book. Back down in the cable car and to town on foot (an hour when you know the way) and to the Albanian National Gallery. 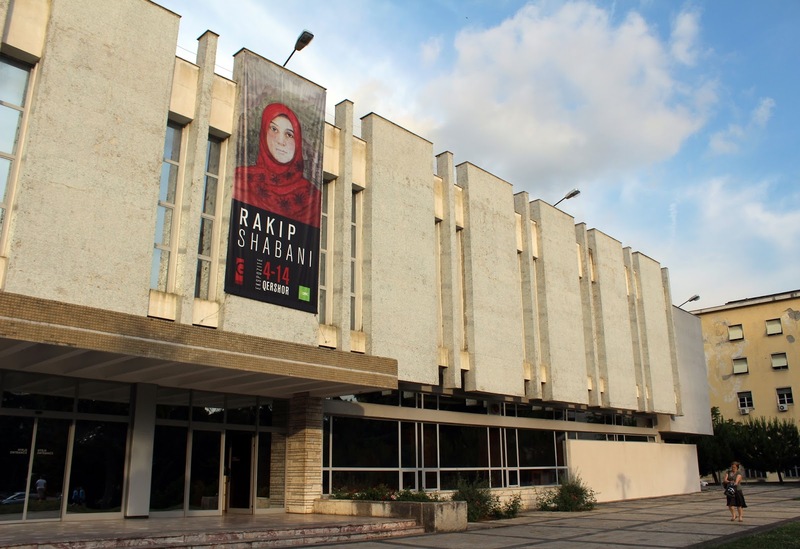 This housed an exhibition by artist Seli Shijaku, mainly portraits from the 50s to the 80s of partizans and people in traditional Albanian dress, and the gallery of Socialist Realism, with stirring images of heroic factory workers, more partizans and including pictures which had been officially blacklisted for being too "formalistic" or "pessimistic" or because the subject matter or person had fallen out of favour with the regime. Just £1 to get in, and I was the only person there. With a heatwave of around 34 degrees forecast, it seemed an ideal day to get out of the city and maybe have a swim. 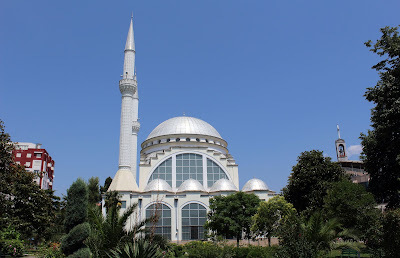 I returned to Durres on the coast where the ferry arrives, an hour's bus ride (65p!) from Tirana. The man sitting next to me started up a conversation and told me how he'd fled from Albania with his brother thirty years ago, walking three nights, hiding by day and finally cutting the barbed wire to get into Yugoslavia. 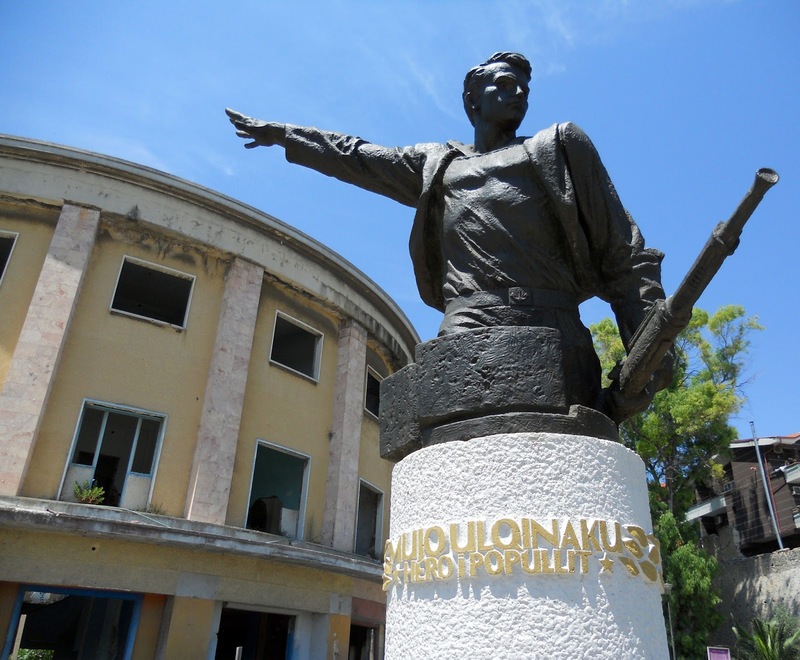 Both his father and grandfather, who were Montenegran, were imprisoned regularly by the Hoxha regime and his grandfather died in prison. After being held in a Yugoslav jail for a while, they were granted asylum in Canada, where he now lives, but he is trying to wrest back his family's property which was siezed by the state. 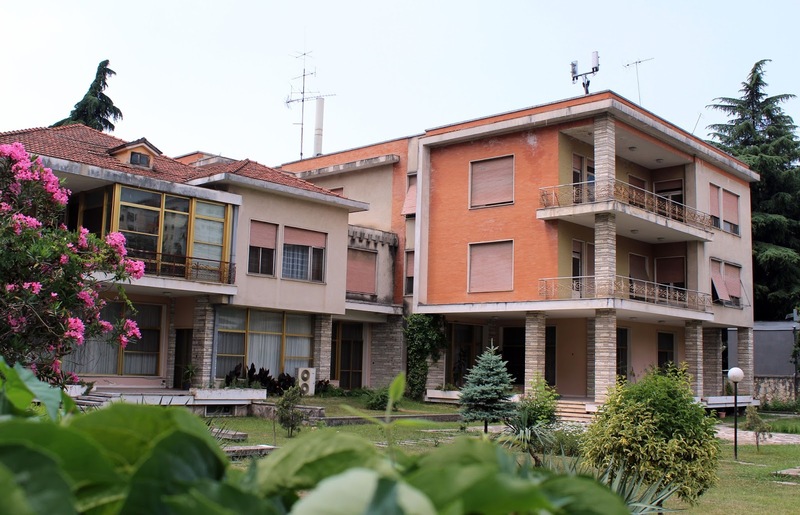 He returns to Albania periodically with his family but each time has to prove that the house he visits (where his cousin normally lives) is legally his, so he'd travelled to Tirana to get all the paperwork, which he showed me. 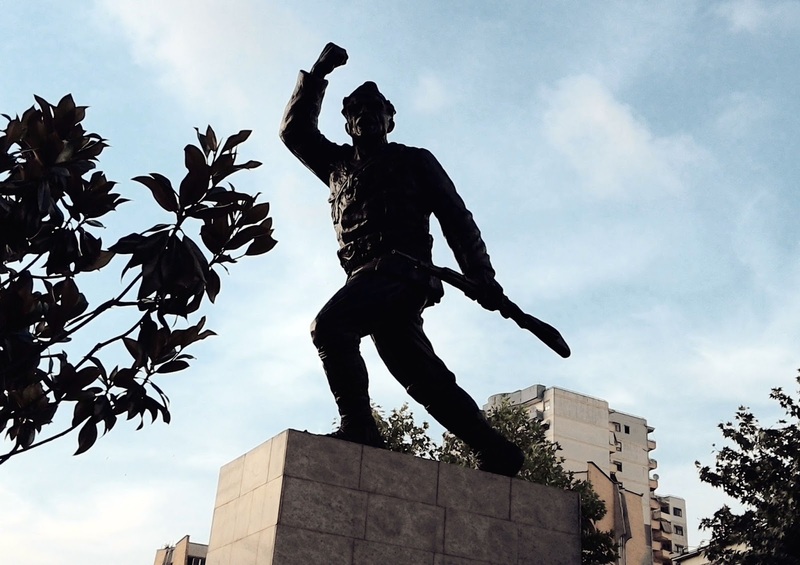 He said he'd never come back to live as the regime is still too corrupt and a lot of it moves along on bribes. 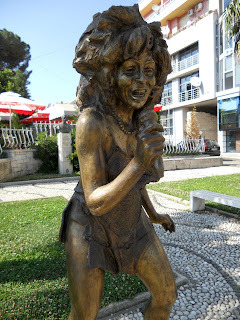 Durres is rather attractive, with long beaches and warm sea, plenty of Roman remains including one of the biggest amphitheatres in the Balkans, and plenty of statues of partisans and, bizarrely, one of Tina Turner too. 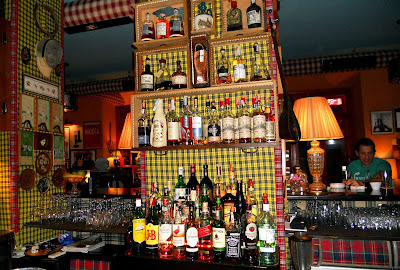 That evening back in Tirana I tried to hunt down the Hemingway Bar which was a recommended hangout, only to scour the backstreets and finally come upon it with a sign unhelpfully saying “Closed for a few days”. I wandered on and came to Birra te Kori, a basement bar with a blaring TV and a squat toilet (there are still quite a few of these to be found) which forced your face into a worrying proximity with a filthy mop and bucket, but at least the beer was good, Kosovan Peja at 60p a pint. And then onwards to the Radio Bar on Ismael Qumali in the trendy Blokku area, once the sole preserve of the Communist elite and now thriving with bars. Radio is decked up with vintage radio sets, Hollywood portraits and, oddly, a picture of my chum ThomasTruax with his Hornicator. A large mojito was £2.50 with complimentary peanuts and mini focaccia, and I sat out in the back area for a couple of drinks, a very chilled and friendly place. Albanian people continued to amaze me - everyone was so friendly and helpful, even when we were communicating in sign language or fractured Italian. People will always help where they can, and I didn’t encounter a single person being rude to anyone, or acting like an arse. Friday was history day. 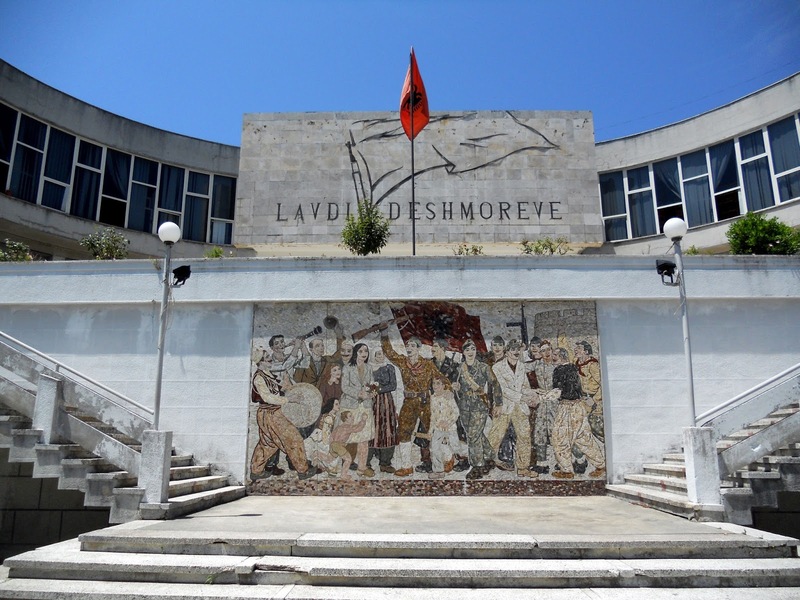 I went to the National Historical Museum of Albania, situated in the wide boulevard in the city centre created by Mussolini when the Italians were ostensibly 'helping' Albania economically, but in reality gearing up for invasion. It starts off with fragments of Roman pots, figurines etc (though I was rather thrilled by the 'urn of tears' where you had to make a big show of crying for a deceased luminary, and gather tears as part of the funerary rite) then lots of reproductions of maps, dolls in national costume, Mother Teresa (yes she was part Albanian), a roomful of stamps and so on. And then you hit upon a most chilling room. It's a space dedicated to the people imprisoned, tortured and killed under the Communist dictatorship, with bloodstained bullet-pocked shirts of those gunned down trying to cross the border, films of show trials and execution by firing squad, paltry artefacts owned by people imprisoned and executed such as spectacles, tobacco cases or locks of hair. There are manacles, torture devices, items found in mass graves and pictures of many of those killed, including elderly women and Muslim, Orthodox and Catholic religious leaders. As you move on you reach the section on resistance to fascism - first the Italian invasion, then after their capitulation, German occupation. Again, bullet-holed clothes, descriptions of how each 'People's Hero' fought and died, though interestingly when you come to Enver Hoxha's coat and rifle, they refrain from describing him in that glowing way. Reading the history of Albania, you see how it's been a political football for millennia, occupied by Rome, Greece, Byzantia, Serbia, the Ottomans, Italy, Germany and latterly under Soviet influence until they fell out, and how fluid the borders in the Balkans have been, with territorial disputes around Kosovo and Macedonia still fermenting, though Greece probably has other thoughts on its mind right now. The Museum did amaze me though, with its untapped opportunities to attract tourism. I wasn’t aware these exhibitions were there, and although on this occasion I wasn’t the only person there, it was very sparsely attended, which was a real pity. 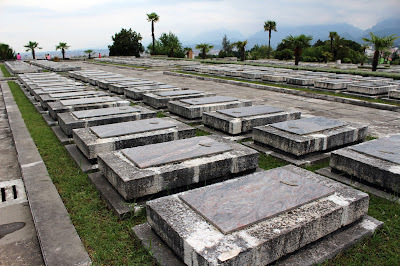 After that I took a hot, slow and pongy 15p bus ride out to the cemetery Varreza e Sharres since cemetery visits are de rigueur on holiday. The guide book says the graves are arranged chronologically and once you get in the right area, Enver Hoxha's brown grave is easy to spot, but they're crammed shoulder-to-shoulder and a) I'm buggered if I could make sense of the chronology as 2006 was next to 1965 and then 1991 and 2003 and b) half the graves are brown anyway. 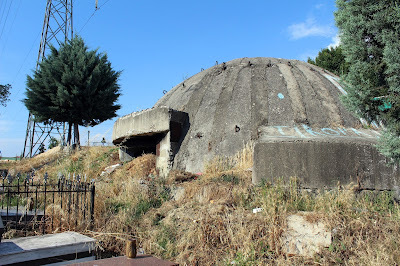 So I was just about to give up and escape the baking relentless sun on the hilltop when I came upon a bunker. In a graveyard! That wasn’t in the guide book. So that made it worth the trip as the bunkers are gradually being removed, apparently. As evening fell I visited the Sky Bar, a revolving bar which served the pokiest cocktails and offered amazing views over Tirana as the sun set. 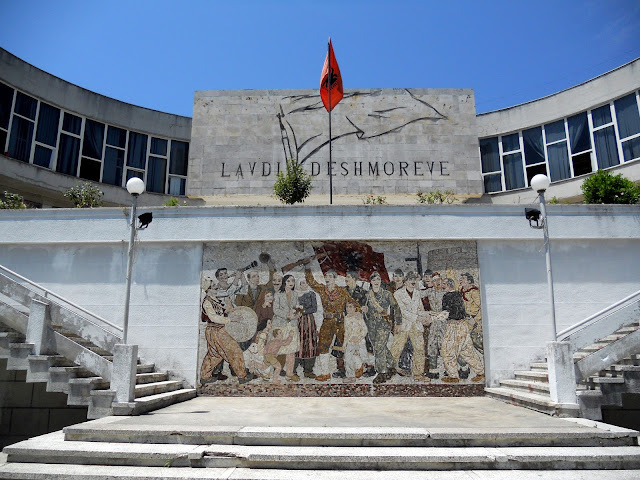 First and last weekend in Albania - this time around, anyway. 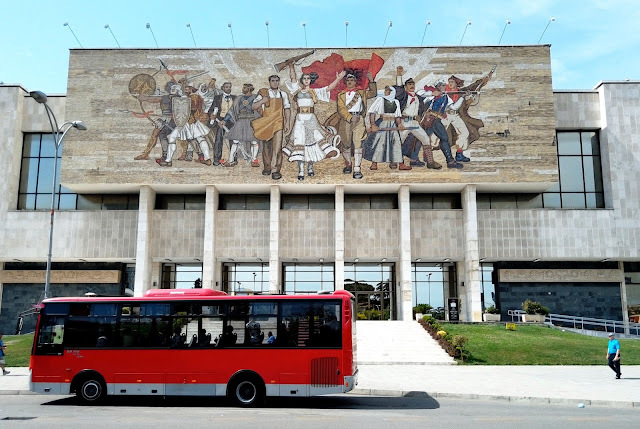 On Saturday I went to Shkodra, 120km north of Tirana, a £1.50 bus ride away on a rickety, creaking, plastic-seated 1980s German coach, partly to get out of town on a sweltering day, partly to check out the onward bus to Montenegro as that's the changing point for Monday's trip. It's a pretty town if you ignore the high rise blocks that dominate the centre, overlooked by a Venetian and Ottoman castle, sat alongside a lake which shares a border with Montenegro, and a shiny new mosque glittering in the sunshine. 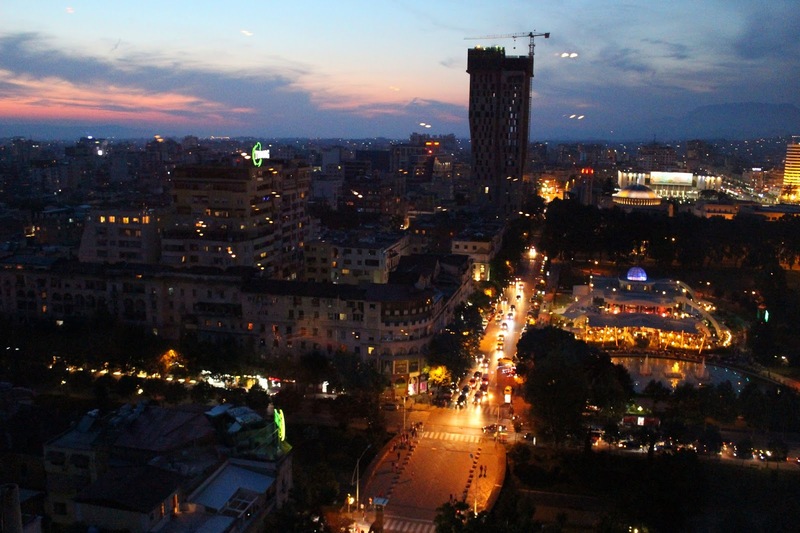 Saturday night back in Tirana, and as I was preparing for an evening bar-hopping, there was a knock at the apartment door. I opened it to find a family of three there. “We’re coming to stay,” they said. “Umm… No, I’m staying here…” I said, bemused, and went to fetch the booking paper to check I hadn’t screwed the dates up. “No, we are staying in the spare room,” they insisted. I got the landlord on the phone, and he breezily said “Oh yes, you’re not using it, so they can stay.” Ah well, the other room was an ensuite so they’d just be in there, I still had the run of the rest of it, and everyone had been so lovely to me that I let them in with a shrug and got on with it. It was all a bit odd though! I found a bar where customers snorted Sambuca through strawers from a saucer. Classy. I got talking to two British tourists who'd just come in from Kososvo and were bemused by the Albanian bus service, which is a law unto itself, but I'd got used to that by now and took them to the Radio bar which was very buzzy now, for more cocktails. During the week there were no obvious tourists in evidence, but at the weekend it livened up, though people I talked with only seemed to be passing through Tirana for a day or so from Greece or Kosovo to get to Montenegro and Croatia, and they seemed surprised when I said I was there for a week and finding more than plenty to do. Sunday was scorching again so I took a chilled stroll up to Parku I Madh - literally "Big Park" - with its memorials to the German and Commonwealth forces who died in Albania in WW2. Coming down the hill though, I spotted something else not mentioned in the guide book. 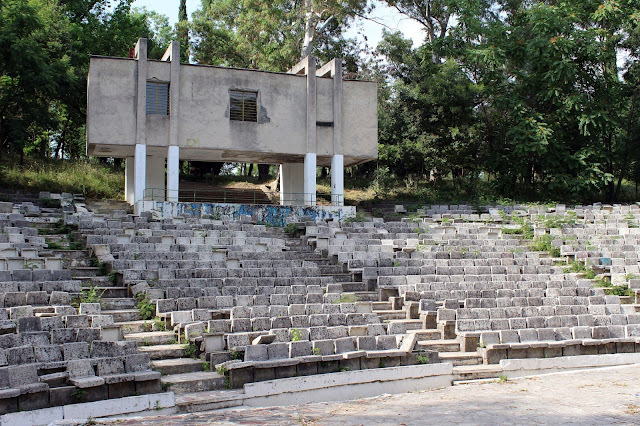 It was a large concrete structure, which at first I thought was an abandoned swimming pool and then turned out to be a huge amphitheatre, with crumbling concrete seats, graffiti and encroaching weeds. These Communist follies are fascinating - what do you do with such things when that era has passed and you want to move on? The huge mural on the National Museum and the many monuments remain, but I found these abandoned buildings and structures endlessly intriguing, and I guess the forces of time and nature are the ones that will decide their fate. Next stop Ulcinj so it's Montenegro or bust! 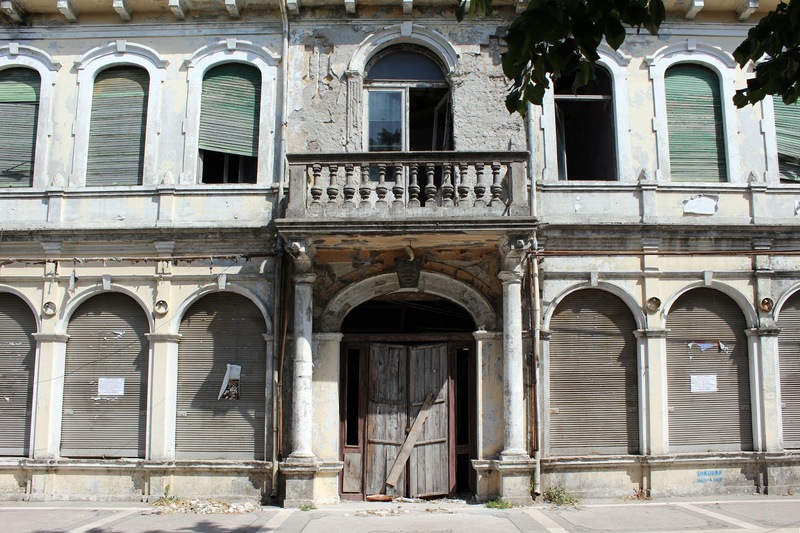 The reddish abandoned "hotel" was actually a government provided residential education center for schoolchildren during the communist era. I visited as well, I got quite close but didn't go inside as it's now home to a very aggressive wild/stray dog and a coupe of wild horses. I got close enough to hear both horses and dogs but decided going in wouldn't be a good idea! Just up the road though, was a more recently abandoned hotel wbich I did go inside, there was still a christmas tree in the main function room.